For once I just shut my mouth and followed directions. I made my mom's recipe. Which is the Sure-Jell (pectin) recipe. And you know what? It rocks! I guess some things shouldn't be fiddled with. My poor mom. Sometimes I'm a bit too hard on her. When she told my brother that we were going to make this jam he scoffed at her, saying, "Kayle probably won't want to make your jam, she'll want to make her own!" Because I'm a snobby meanie pants. But this time that was not going to happen! I trusted in my family and their time-honored tradition of making this recipe, and it was totally the right choice. Mom and I made this jam together, as a team. So I'm pretty sure we put some magical mother-daughter bonding love in there. Which is probably why it tastes so amazing. Plus all the sugar. Yeah. It's probably both. 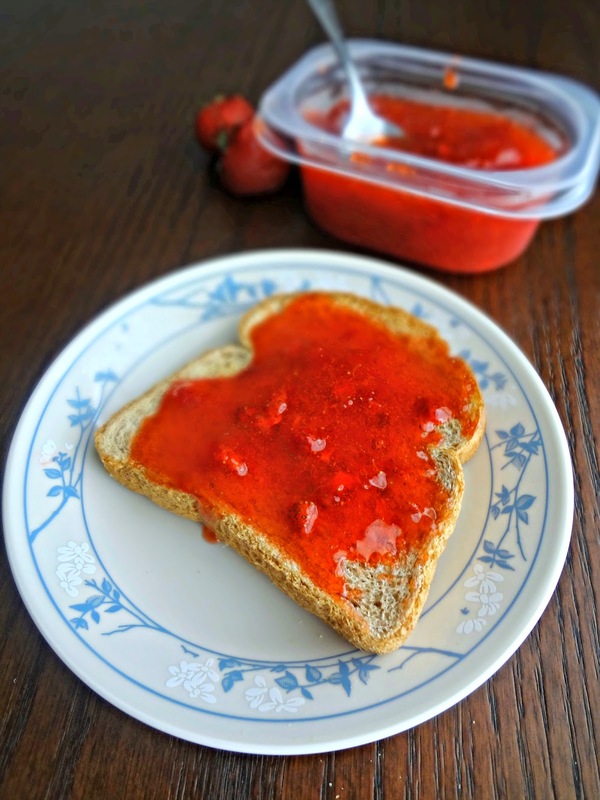 Michael took one bite of a piece of toast loaded up with this jam and he said, "THIS is what strawberry jam should taste like!" Recipe could not be simpler. 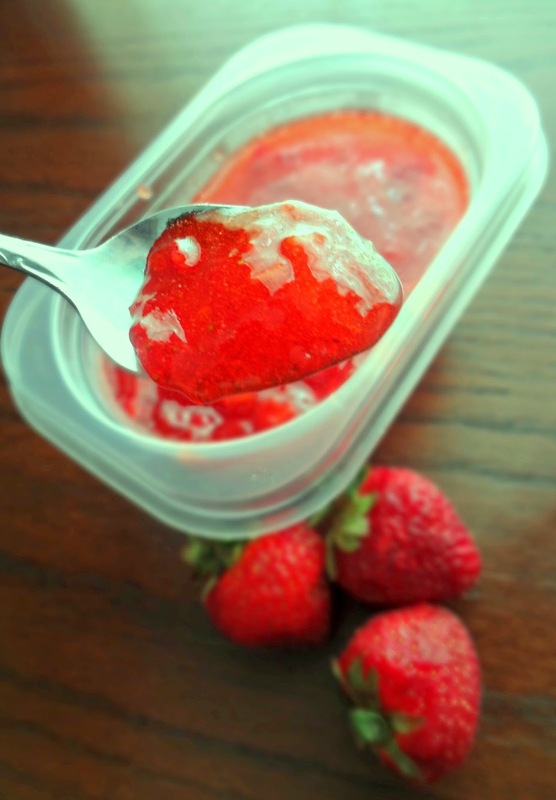 You just mash some gorgeous strawberries, add in some sugar, cook a little pectin, mix mix mix, let sit, then freeze! DONE. Super easy. My mom made like a triple batch so we ended up with a ton of jam! It got given to aunts, uncles, grandma, etc. 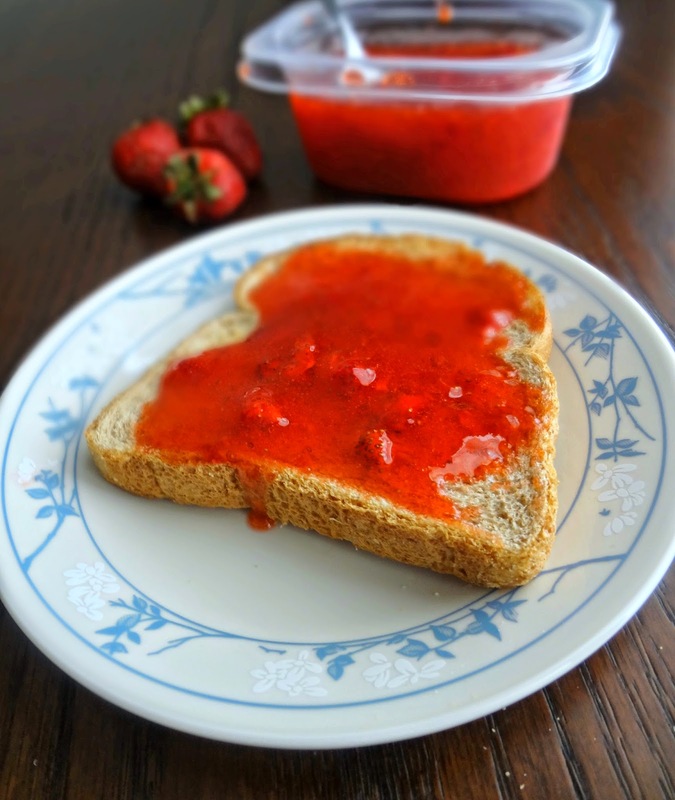 So we spread the love via spreading the strawberry jam! 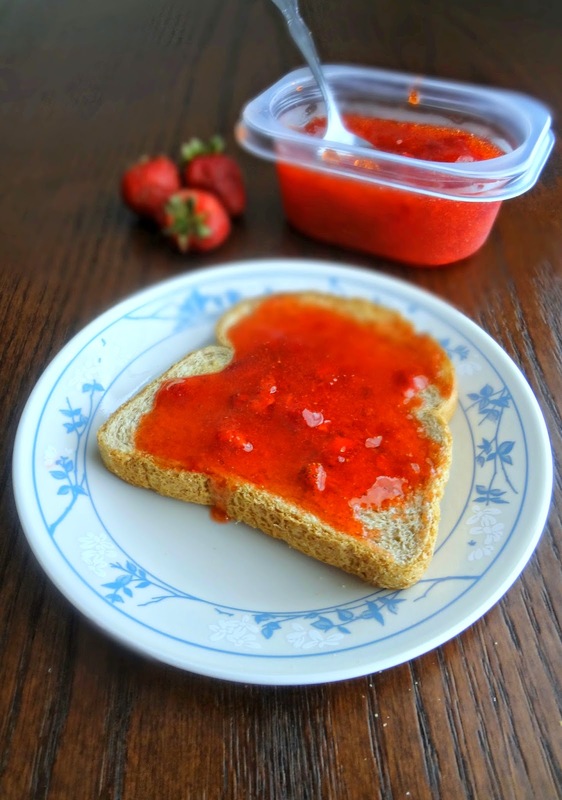 This was the first strawberry recipe I made and now it is my final post for #StrawberryWeek-how perfect! Ending it the way it began. Makes 5 cups of jam. Wash and rinse 1-2 cup size plastic containers with tight fitting lids. Wash and remove the stems/hulls from the strawberries-removing any bits of green. Measure out the exact amount of sugar and add to the crushed berries. Mix thoroughly and allow to sit 10 minutes, stirring occasionally. Combine pectin and water in a small saucepan and bring to a boil over high heat, stirring constantly. Boil for 1 minute and then remove from heat. Sir the pectin mixture into the strawberry mixture until the sugar is completely dissolved and the mixture is almost smooth-for about 3 minutes. Pour into the prepared containers, leaving 1/2 in. of space at the top of each container. Cover. Let the filled containers sit at room temperature for 24 hours. Then refrigerate for up to 3 weeks or store in the freezer for up to 1 year. 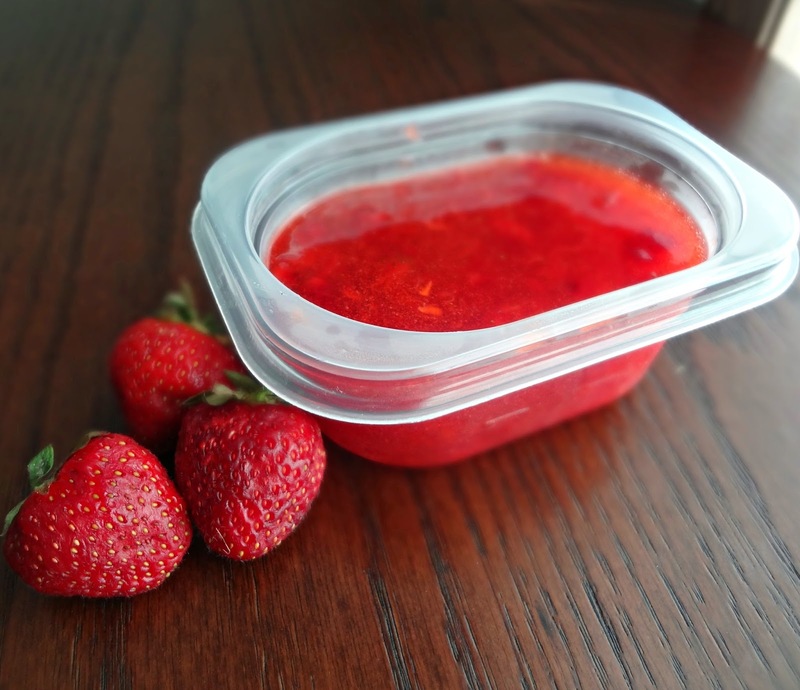 When ready to use, put frozen containers in the refrigerator (give them 1 or 2 days until fully thawed to use).